You just had to know that I couldn’t let National Ice Cream Month go by without a DIY celebration! We here at the Waller household enjoy a spoonful or two of this frozen dessert every night, and sprinkles are one of my all time favorite toppings. 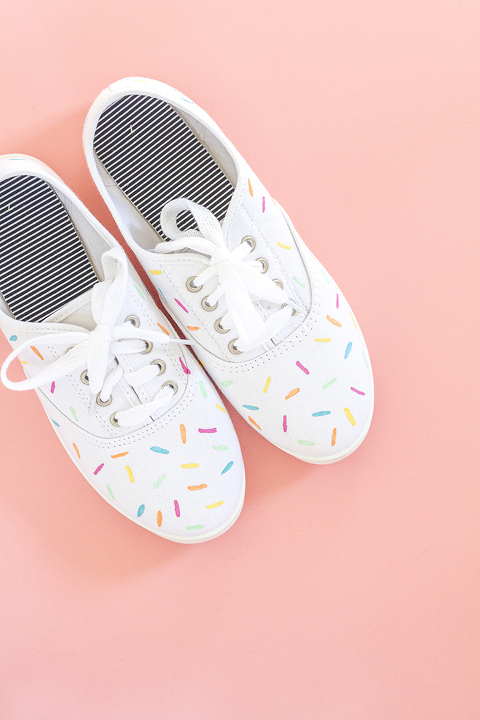 So, of course, I took things too far and added them to a pair of white canvas sneakers…If you, too, can’t get enough of this tasty summer treat and want to commemorate that love with a pair of painted shoes, read on for the oh-so-simple instructions. The process couldn’t be easier—really! Start by squeezing a little drop of paint into each of the separate compartments of your plastic paint tray. 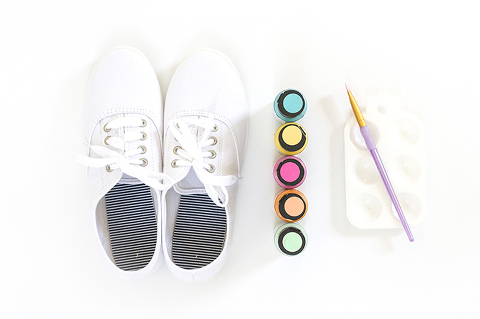 Since you’ll only need a dozen dabs of paint for each color on each shoe, you’ll just need a small amount, so don’t go crazy when adding pigment to your tray. Even with my super scaled back estimation, I ended up washing excess paint down the drain—learn from my mistake. Dip your angled paint brush into each of the five colors, and then dab them with a steady hand across the surface of each shoe, making sure to switch up the direction of your brush each time. I went one color at a time, starting with the blue, and left about an inch of space between each painted sprinkle. Then, I cleaned my brush and dabbed it into the pink paint, and added that near the blue sprinkles. And so on, and so forth with the rest of the colors, washing my brush between each step. I only needed one coat, but feel free to go back over them a second time if needed. After finishing with the orange paint, I cleaned my brush and paint tray, and then left the shoes to dry for a couple of hours. 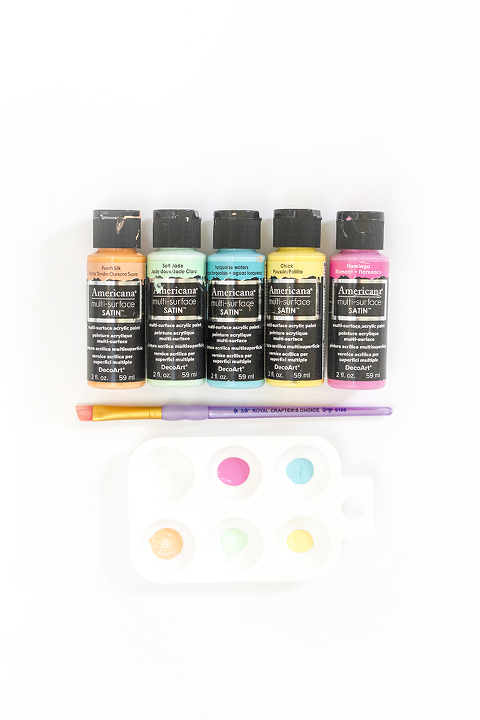 Thankfully, DecoArt Americana paint is made for any kind of surface, incuding canvas and fabric, so you don’t need to treat the shoes with sealant to make the color stay. That said, you may want to spray on a waterproofing solution made for shoes in case you’re worried about staining your freshly painted, bright white kicks! I have had way too much fun with painted canvas shoes in the past year or so (evidence: pineapple & banana shoes, leopard print shoes, Kate Spade look-a-like polka dot shoes) and think I just might turn this into a mini series! Would you like to see more shoe makeovers like this? To celebrate the soft launch of this series, you can follow along with hashtag #shoesizediy as I craft my way through a pile of plain white sneakers. What would you like to see next? !